Here’s something you don’t see every day: the CEO of a major corporation completely dressed down and hanging around their storefronts. 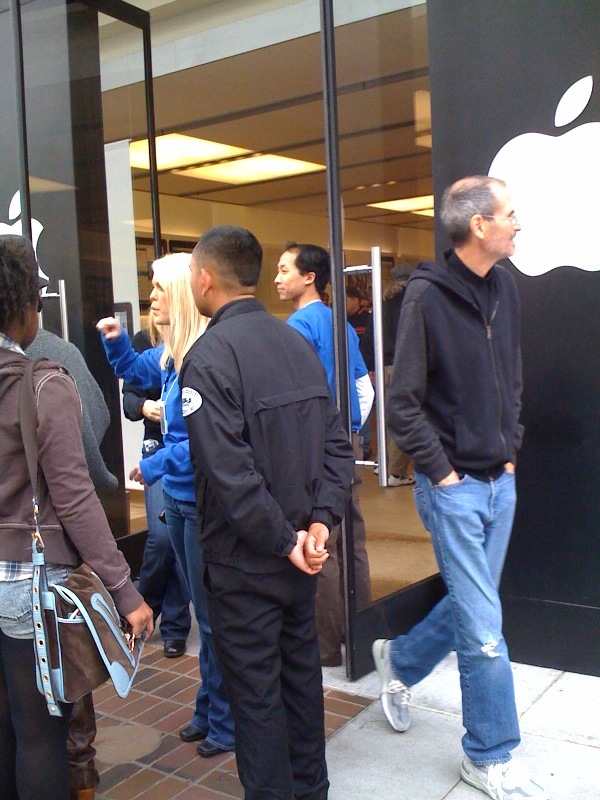 Apparently Steve Jobs occasionally pops into Apple Store’s for various reasons, although this particular picture was supposedly taken on the iPad launch day. Thanks to Damien for sending us the picture and story from TwitPic. Hey, just a regular guy. Cool. Dressed down? Those are the same clothes he wears to all of his Keynote addresses! A hoodie and busted up jeans. Somebody get that man some flip flops! >this particular picture was supposedly taken on the iPad launch day. Uh, yes, that’s EXACTLY what happened here… I saw a brief news clip of this on my local news that they picked up from their network feed (ABC in this case…). I agree, it’s pretty remarkable in that no one appeared to be going gaga over his presence at the store, this one in Palo Alto. I think Steve Jobs gets thinner with every iMac model released. Connection? Connection? Ya, he’s sick. A-hole. that’s pure marketing. he want you to think at him as “the normal guy” as YOU think you are. Wow, amazing weblog layout! How long have you been running a blog for? you make blogging look easy. The total glance of your website is magnificent, let alone the content material!